The hottest names in music were all gathered at the Microsoft Theater in Los Angeles for a night of chart-topping hits and jaw-dropping performances at the American Music Awards. Hosted for the second time by Tracee Ellis Ross (yes, Diana Ross’ daughter), the star-studded awards show was full of ‘OMG’ moments that are sure to go down in AMAs history. Here are our favourite highlights of the night. Look what you made her do! If there’s one person who can blow the roof off a place, it’s Taylor Swift. In her fiery and slightly terrifying rendition of ‘I Did Something Bad’, the new and improved T-Swift whipped out a huge snake prop (affectionately named Karyn) and even got bleeped out at one point during her performance due to a cuss word in the lyrics. Say what you will about Tay-tay, but she just proved why she’s a top entertainer. You might know her as Diana Ross’ daughter or the awesome Rainbow Johnson on Black-ish, but Tracee Ellis Ross can certainly hold her own when it comes to hosting an awards show. Her opening number saw her decked out in a latex black cat suit, rapping to Cardi B’s ‘Bodak Yellow’ AND dancing to songs that include Childish Gambino’s ‘This is America’ and Beyonce and Jay-Z’s ‘APES**T*. There’s simply nothing this woman can’t do. Who knew dresses could do THAT? Rocking a hot pink dress that accentuated her famous curves, pop icon Mariah Carey was present at the AMAs to perform her new single ‘With You’ – but that wasn’t just what her dress was for. As she belted out her slow jam, an army of dancers suddenly appeared from the tulle bottom of her skirt! In a joint performance of ‘Lost in Japan’ with Zedd, Shawn Mendes stole our hearts as he made us all swoon with his brilliant vocals whilst standing below hundreds of paper lanterns hanging from the ceiling. A picture-perfect scenario, don’t you think? The talented Khalid took home his first ever AMA for best soul/R&B artist and and thanked his mother, family and fans during his speech, before giving a shout-out to his Texas Democrat representative in relation to the upcoming Mid-Term Elections. This just makes us even more hyped up for his upcoming concert in Singapore! Say hello to our new king of memes, Taran Killam! Celebrities in the audience seat are no strangers to the wandering cameras that catch them mid-reaction when they least expect it. From Taylor Swift dancing in her chair to Chrissie Teigen’s crying face, we can now add Taran Killam’s epic shocked expression during Cardi B’s performance to the list. In a non-traditional take on Halsey, Benny Blanco and Khalid’s ‘East Side’, the stage had been cosily set up to look like a studio jam session. As Khalid started the song, Halsey had apparently been live tweeting on the couch before it was her turn to sing. Way to use your time on stage, Halsey! Having already won an AMA for best pop/rock song, Camila Cabello delivered a stunning rendition of her new single ‘Consequences’, accompanied by a full orchestra that sent chills up our spines. Her formal ball gown and long gloves also really made for a fresh change from her usual, upbeat looks. Just when we thought the AMAs had reached its peak, Ciara took to the stage for a show-stopping remix of ‘Level Up’ in a space-age white leather bodysuit – and boy were we shook. Known for her grade A dance abilities, homegirl slayed her performance while serving up major Janet Jackson vibes. Ciara’s performance was so lit that even Missy Elliott’s funky white sister (as seen on The Ellen Show) couldn’t help but get hyped too! We all know how crazily talented Brendon Urie of Panic! At The Disco is. In a goosebumps-inducing tribute to the legendary rock band Queen (live-streamed from Sydney where they are currently on tour), Brendon and his band did justice to their tribute performance in a mind-blowing rendition of the Queen classic ‘Bohemian Rhapsody’. Just take a listen and you’ll see what we mean. Since her recent political post on Instagram, many were expecting Taylor Swift to address the issue during her first speech of the night. When she didn’t do so, people were surprised – with some thinking it was a one-off PR stunt. Little did they know, our girl was keeping that for her Artist of the Year speech where she cleverly and subtly transitioned from thanking her fans to encouraging people to register to vote for the Mid-Term elections. Anyone know if T-Swift is available to write our speeches? What was your favourite moment of the AMAs? Let us know in the comments below! Somebody hold us – BTS just dropped the ultimate bomb on us by announcing the upcoming concert dates for the Asian leg of their Love Yourself world tour, and it seems like our prayers are finally being answered. 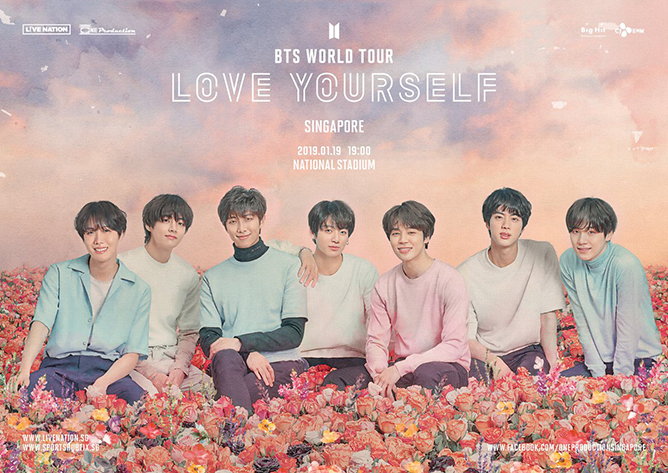 Start saving up fellow ARMYs, ’cause our favourite boys will be heading to Singapore this January! On 10 October, the seven-member K-pop supergroup announced that they will be performing a two-night show in Taoyuan, Taiwan this December, before making their way over to Singapore in January, Hong Kong in March and Bangkok later on in April. Other Asian dates have yet to be announced. As soon as the news is out, local organisers One Production also confirmed that the band will be holding their highly-anticipated concert at the 55,000-seat National Stadium – a mega upgrade compared to their 5,000-capacity gig as part of their The Red Bullet concert at The Star Theatre five years ago. To add on, BTS is the first ever Korean act to stage their own solo concert at the prestigious venue. Look at how far they’ve come! 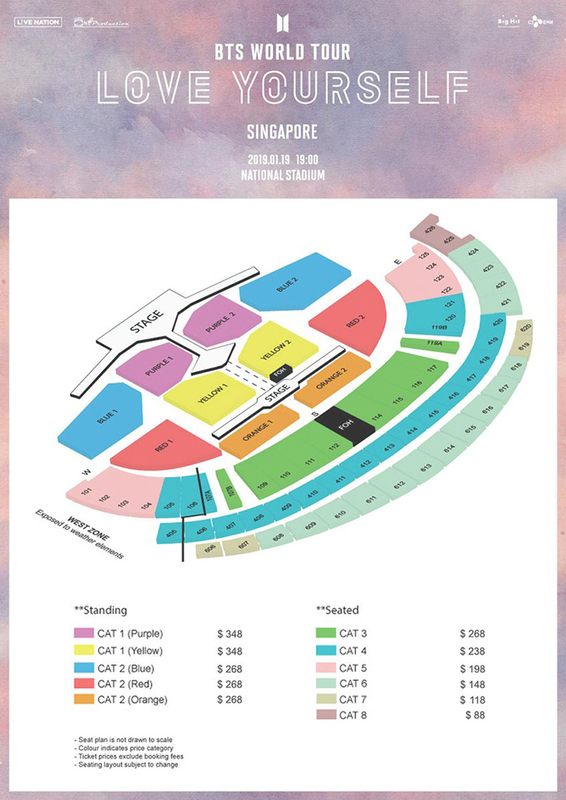 All Cat 1 ticket holders are entitled to join in a Sound Check lucky draw event. Tickets will go on sale 27 October, 10am via www.sportshubtix.sg. Good luck, ARMYs! After what seems like forever, K-pop behemoth EXO is making their hotly-anticipated comeback with their fifth studio album Don’t Mess Up My Temp0 on 2 November. EXO is no stranger to experimenting with different genres and concepts with every comeback – whether it’s serving up reggae-EDM vibes with ‘Kokobop’, or going full-on swagger mode with the hip-hop banger ‘Overdose’ – and now we’re getting an entire album dedicated to the rock genre. Bikes, bad boy vibes and leather jackets? We’re digging that. As if EXO-Ls aren’t losing their heads already, it’s been confirmed that Lay will be participating in the Chinese version of this new release, making it the first album to feature all nine members since their third studio album Ex’Act in 2016. At the news of the long-awaited OT9 reunion, it didn’t take long for fans to get extra riled up for their domestic return. First things first, we’re no longer going kokobop. The Kokobop era will be missed. There were some EXO-Ls who went crazy with memes. Others were freaking out about their new rock concept. Throwback to their heavy metal version of ‘MAMA’ on 2016 SBS Gayo Daejun. Iconic. But most importantly, everybody can’t wait for OT9! EXO OT9 COMEBACK YALL!!!!!!!!!!!!!! THIS IS A WIN FOR EXO AND EXO-LS ONLY!!!!!!!!!!!! Repeat after us: the kings are back! EXO is set to make their full group comeback with Don’t Mess With My Tempo on 2 November 2018. Album preorders are now open. 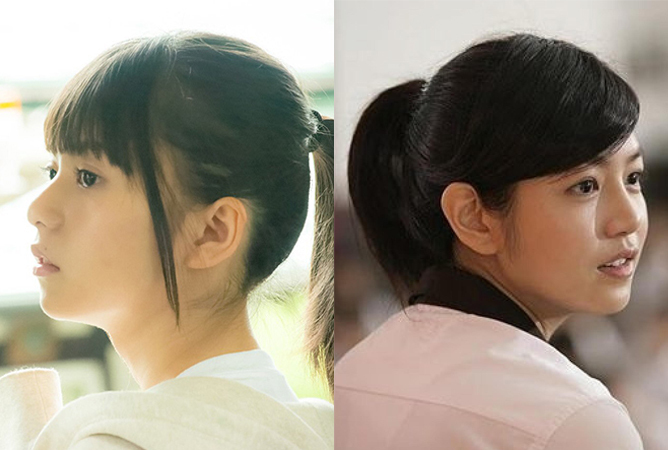 There's Now A Japanese Remake Of Taiwanese Hit Movie You Are The Apple Of My Eye! Who could ever forget the Taiwanese coming-of-age classic that launched the careers of Michelle Chen and Kai Ko, all while stirring the hearts of everyone across the world back in 2011? With its record-breaking success and the surge of remakes recently, we couldn’t help but wonder if You Are The Apple Of My Eye will also be getting its own reboot. And we’ve got good news: there’s now a Japanese version of the Giddens Ko-directed flick titled Ano Koro, Kimi Wo Oikaketa (Those Years, We Went After You). 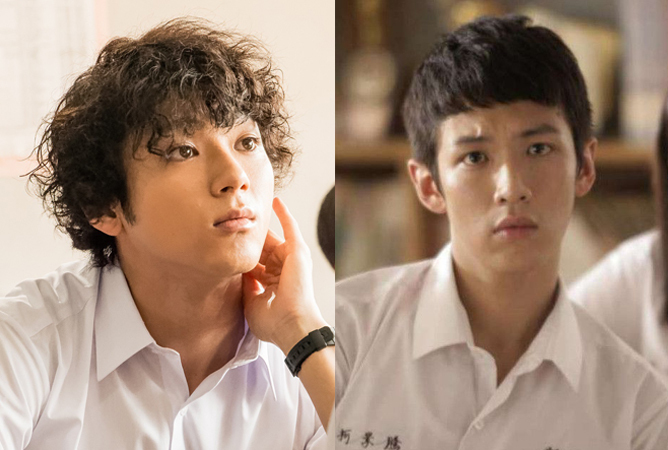 Led by Yasuo Hasegawa, the highly-anticipated remake stars rising actor Yuki Yamada (Mischievous Kiss, Strobe Edge) and Nogizaka46 member Saito Asuka (Sakuran, Shoujo no Miru Yume) as protagonist Mizushima Kosuke and heroine Hayase Mai respectively. Although no one can possibly take the place of Kai Ko and Michelle Chen’s iconic roles as Ko Ching Teng and Shen Chia Yi, we can’t deny that the casting team did an impeccable job at replicating their Japanese counterparts – it’s almost as if we’re looking at a parallel universe. Just check out their uncanny resemblance! While the original story begins in 1994, the new version will be taking place in the 2000s instead. The setting has also been changed to Japan, but we’re glad to know that the production crew has kept most of the plot in place which means they have a lot of hype to live up to. Some scenes were even filmed in Pingxi, Taiwan for an additional dash of nostalgia. For the uninitiated, You Are The Apple Of My Eye chronicles the decade-spanning romance between a straight-A student and the resident class clown as they navigate adolescent angst and growing pains. What does f(x), DAY6 and Apink have in common? Besides earning fame as mega-successful celebrities in their own right, these hard-working stars have also made their personal debut on YouTube – showing fans a different side of themselves beyond their onstage personas. Here’s a list of idols who are killing it in the YouTube game and deserves a follow, stat! Why you should subscribe: With a channel name like What The Pineapple, it’s hard not to hit the subscribe button. Her OG WTP videos consists of viral challenges, crazy mukbangs and occasional Q&As. But what really impressed us was her iconic diss video above, where she addresses her haters in the most savage way yet. We truly stan an unbothered queen! It wasn’t until recently that the f(x) member sprung back to action after taking a short break from YouTube, and began sharing more of her self-produced mixtapes, song covers and behind-the-scenes footages. She hasn’t forgotten her comical roots however, making sure to include a sprinkling of entertainment value for her longtime viewers – such as the recent carpool karaoke madness you can check out here. Why you should subscribe: When Jae is not busy rocking out with his band, the DAY6 vocalist can be found goofing around on YouTube with his fellow idol pals including 2PM’s Nichkhun, f(x)’s Amber (yay, YouTube buddies!) and CLC’s Sorn. With his witty and outgoing personality, you’ll never be bored of his meme-worthy content and hilarious antics. Sadly, the social media extraordinaire has declared The End Of JaeSix due to DAY6’s recent comeback schedules, but fret not – we smell a season two coming up very soon! Why you should subscribe: Since parting ways with 2NE1, Dara has been keeping her beloved Blackjacks updated on her activities through her YouTube channel, DARA TV. Known for her quirky charms and down-to-earth attitude, she brings us along on her schedules and vacations via a series of vlogs – giving us an intimate look into her day-to-day life. Our favourite video? Her recent trip to Singapore, where she vlogged herself doing touristy things like enjoying chilli crab, visiting the USS, taking the Singapore Flyer etc. Come back soon, Dara! Why you should subscribe: Can’t get enough of Apink? Fans of Bomi will be stoked to know that the K-pop sweetheart has opened up her own YouTube channel adorably named Bbom Bbom Bbom, where she regularly uploads videos to communicate with fans – whether it’s taking us through her skincare routine, showcasing her hidden culinary skills, or even unboxing fan gifts on camera. In one of her latest videos, she introduced a fresh take on nail art: turning falsies into intricate, monochromatic designs. Perhaps it’s the start of a new nail art trend? Why you should subscribe: If you’re into all things K-beauty, the AKMU darling is your go-to girl. Her channel has everything you could ask for: makeup tutorials, fashion hauls, dieting tips, daily vlogs… the list goes on. We especially love her festival makeup tutorial, where she gets all glammed up with this gorgeous sparkly look that’s perfect for the upcoming music fests. Oh, and did we mention she also does ASMR and slime videos? Just another reason for us to love her! Why you should subscribe: Former MBLAQ vocalist turned Internet personality G.O and girlfriend Choi Ye Seul literally scream couple goals. On their joint YouTube channel O.Y Couple Story, these lovebirds upload heart-fluttering videos of them going on fun dates, hanging out with friends and more. Try spotting a certain MBLAQ member making a cameo in their recent video above! Which K-pop idol do you wish to see opening up their own YouTube channel? Let us know in the comments below!